There is a progressive reduction in the 1965 dip in the revised historical data over the decades. 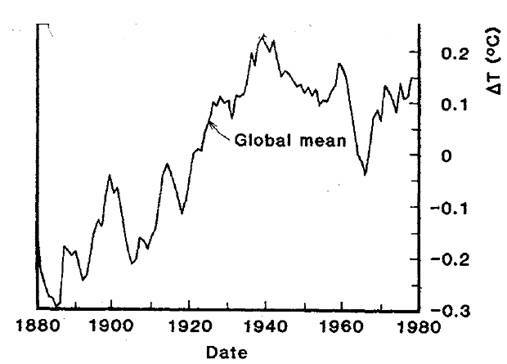 The warm years in the 1930s-1940s were reduced between 1987 and 1993. 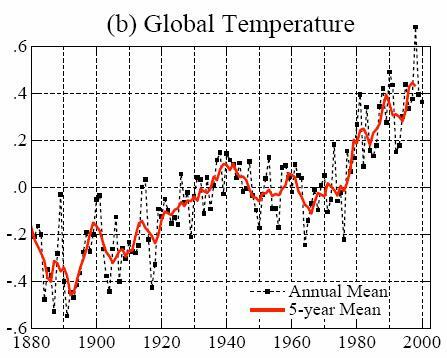 The cold years in the same period were warmed so that the average is very nearly the same but warm years and variation have been reduced. 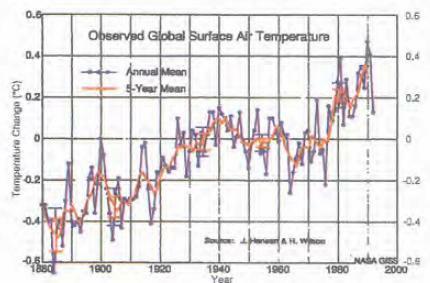 For the Hansen 2007 data, the 1980s – 1990s temperatures were reduced from the Hansen 2001. The 1998 El Nino was reduced from 0.7 to below 0.6 (and less than the 2005 anomaly). 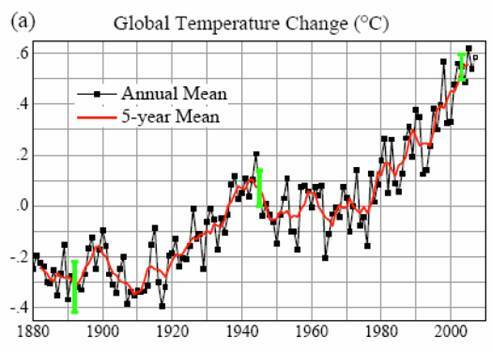 The effect of this is to pretend that the warming trend is increasing. 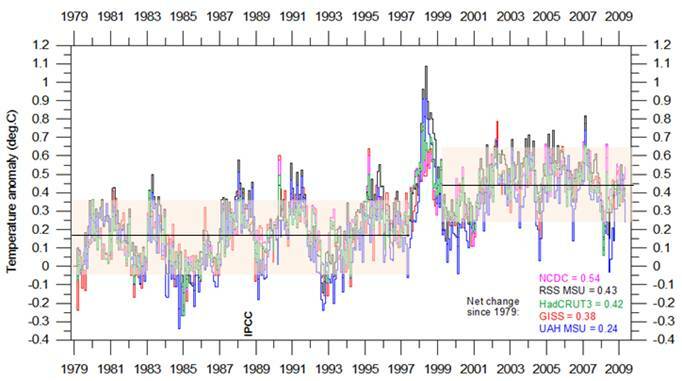 It also helps to hide the fact that most of the warming occurred in just two very short periods: the 1976-1980 climate shift and the 1997-1998 El Nino more readily seen in the 2001 than in the 2007 revision. 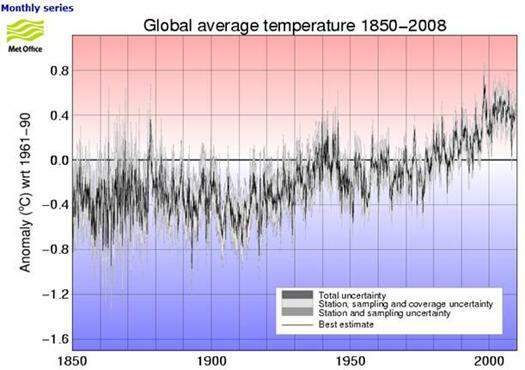 The following figure shows the Hadley Climatic Research Unit global average temperature anomalies through 2008 (the IPCC uses data provided by HadCRU – plot from: [http://hadobs.metoffice.com/hadcrut3/diagnostics/global/nh+sh/]). The following figure shows the Hadley plot with Hansen 2007 superimposed (Hadley and Hansen use different base periods for the calculation of anomalies, so the zero point is at a different location). 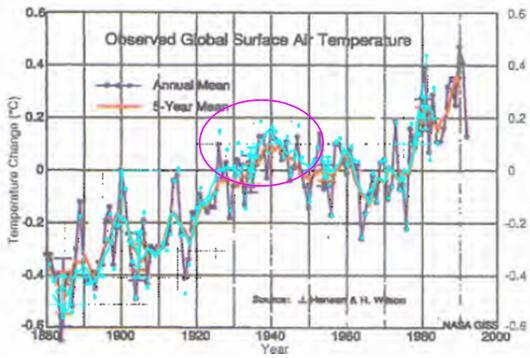 Hansen removed most of the dips in the data (i.e. ca. 1910, 1923, 1947, 1965, 1975). 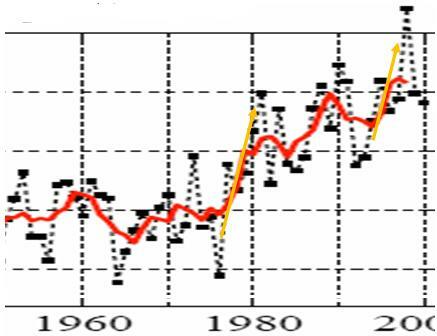 Hansen shows 2005 as the warmest year whereas Hadley shows 1998 as the warmest year. 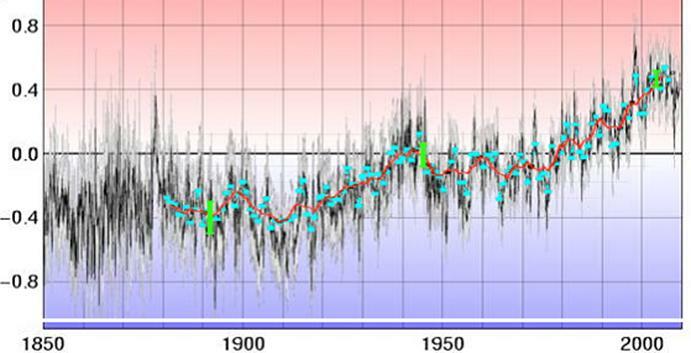 Hansen’s 2-sigma error bars (green) are very misleading compared to the range exhibited in the Hadley data. In 1988 Hansen testified before the US Congress to initiate the global warming scare amongst government. 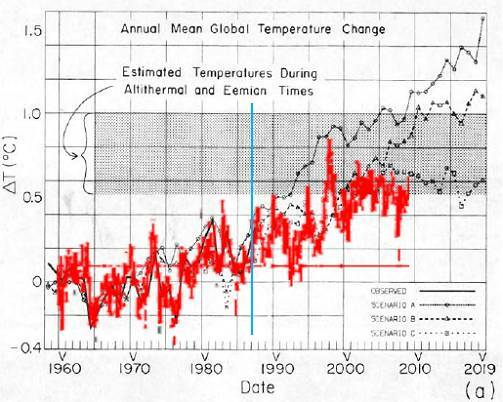 He provided temperature predictions based on climate models including three scenarios: ‘A’ had an increasing rate of CO2 emissions, ‘B’ had constant rate of CO2 emissions, and scenario ‘C’ had reduced CO2 emissions rate from 1988 levels into the future “such that the greenhouse gas climate forcing ceases to increase after 2000” (Hansen 1988, [http://pubs.giss.nasa.gov/abstracts/1988/Hansen_etal.html]). 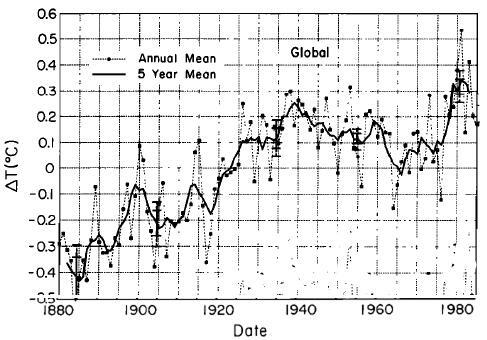 The reason for Hansen’s periodic revision of the climate history: the data in the last two decades has not matched his predictions. It most closely matches his scenario C – reduced CO2 emissions. 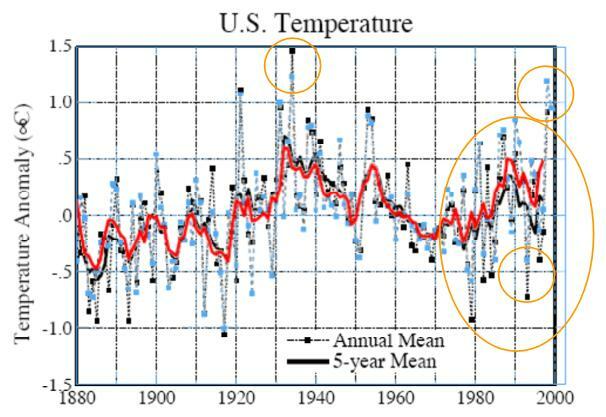 Hansen did similar manipulations on the US data to increase the late 20th century warming, since the US has been lagging the globe and has not been showing significant warming. 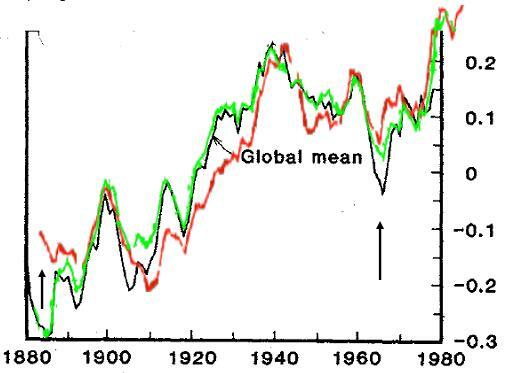 In fact the late 20th century warming had a virtually identical “acceleration” as the early 20th century warming. 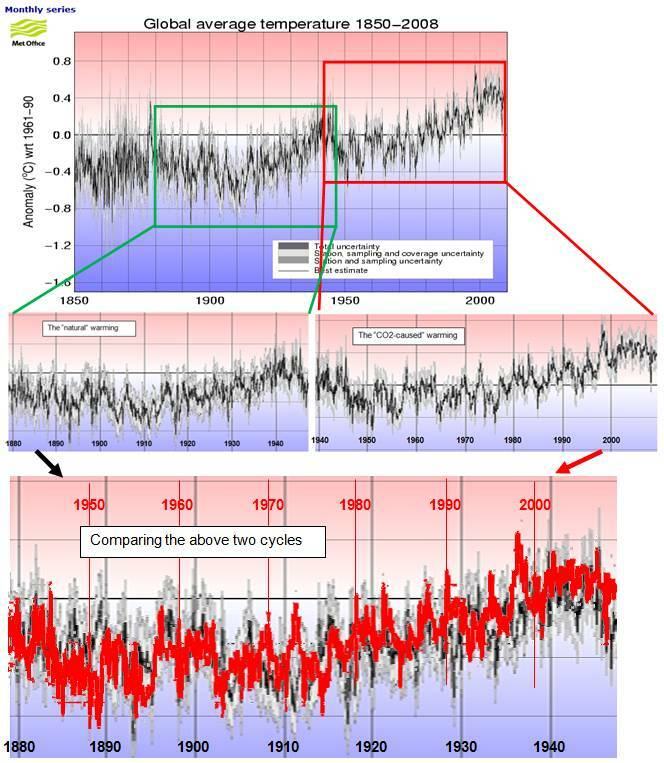 As can be seen from the above figures, the two cycles were nearly identical, and yet Hansen and the IPCC say the models can explain the early 1900s cycle with only natural forcings, but anthropogenic CO2 is needed for the later cycle. There appears to be a serious problem with the models when two identical cycles have two very different causes. James Hansen has become one of the most outspoken anthropogenic global warming alarmists. 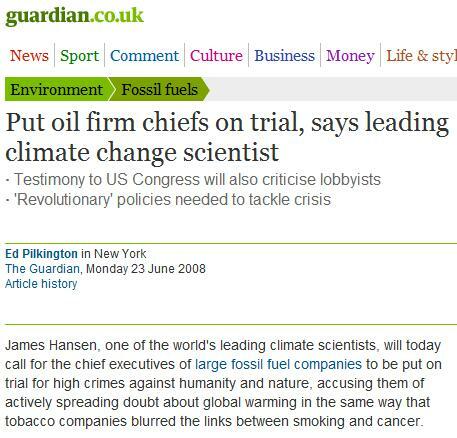 James Hansen has become one of the most financially rewarded government employed alarmists. “U.S. climate scientist James Hansen won a $100,000 environmental prize Wednesday [2010 Apr 7] for decades of work trying to alert politicians to what he called an unsolved emergency of global warming.